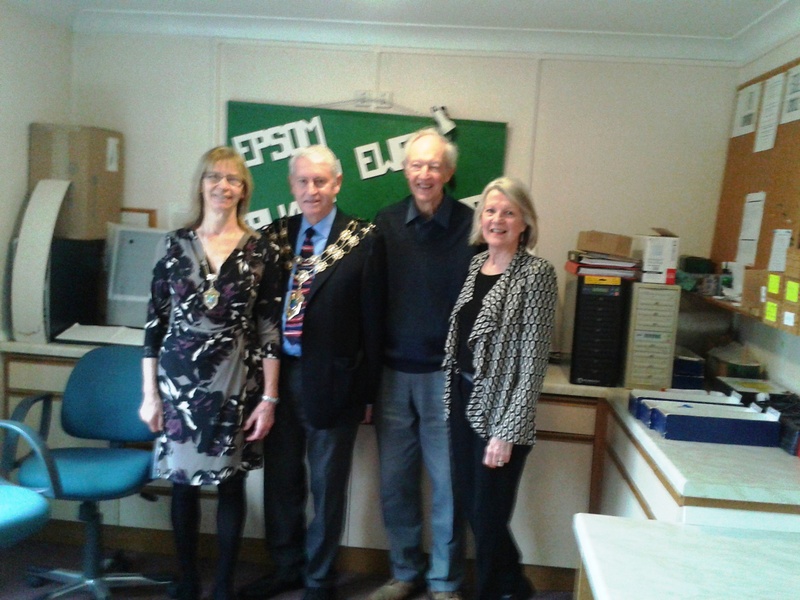 There was great excitement at our recording studio on the 7th January, when our Honorary President, His Worship the Mayor of Epsom and Ewell, Councillor Christ Frost and his wife, the Mayoress, Liz, visited us. 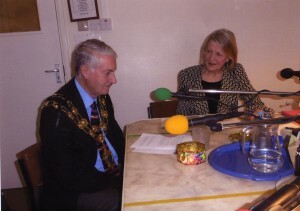 After chatting with our volunteers, and learning more about how we have produced and distributed our weekly Talking Newspaper for more than 40 years, the Mayor sat in for an ‘on-air’ interview with News Editor Jan Collier. Welcoming the Mayor and Mayoress and thanking them for taking time out of their very full schedule, Jan asked the Mayor to tell us a little about a typical week in his year in office and about his three chosen charities. 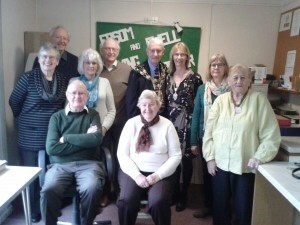 He began by saying how pleased he was that his wife Liz could join him on this visit, particularly as she was an Optometrist by profession and had a great understanding of a lot of the issues affecting many of our listeners. 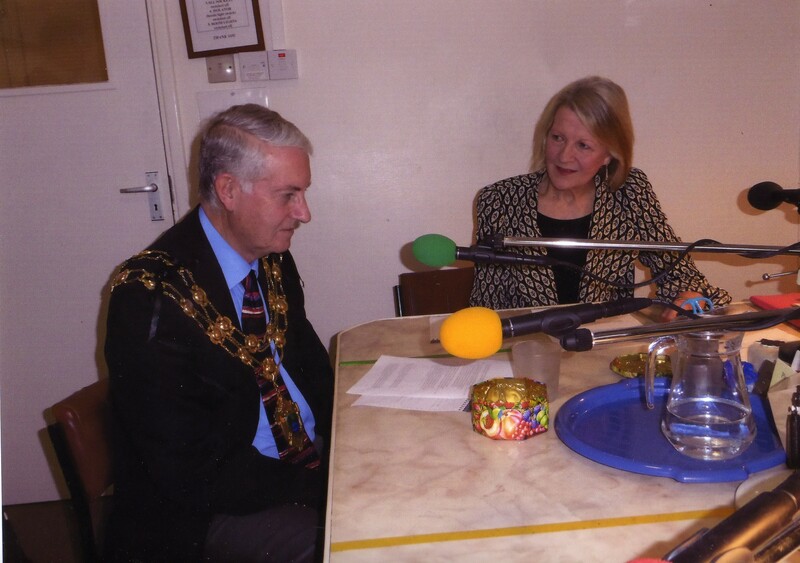 After chatting about his role as Mayor and some of the forthcoming fund-raising events, Jan put to him a final ‘surprise’ question. On learning that one of his personal interests is growing soft fruits, she asked if he had any tips for our volunteers and listeners. Smiling broadly, he replied: ‘I wouldn’t claim to be an expert but I have been growing soft fruits for many years. I find that pruning is a key part of producing a quality fruit, particularly red and black currants. Fertilising in Spring with sulphate of potash will help the flowers develop and if you are in rather an exposed area, cover with netting or put them in a fruit cage. I have tucked mine among my shrubs and so far the birds haven’t found them’. 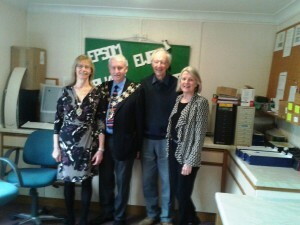 The Mayor then thanked us for a most enjoyable visit and wished everyone at the Epsom and Ewell Talking Newspaper and all our listeners a very Happy New year. This entry was posted in Talking News by eetn_admin. Bookmark the permalink.